It doesn't say that they are working on Oldboy 4K Transfer in Korea (wouldn't make sense), but that (people in) Korea are working on it. No idea where Google is getting the "We work on" from. It also says that they are planning to release their German UHD (based on that transfer) this year. 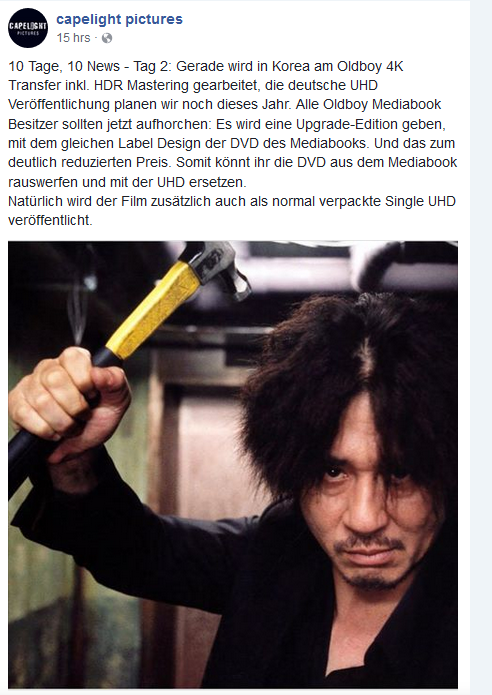 For owners of the German Oldboy Mediabook (digibook) they will release an Upgrade-Edition, which will be a UHD featuring the same label design of their already existing DVD inside their digibook. Which means people will be able to replace their existing DVD with the new UHD and they will sell that one for a "significantly reduced" price. Could be an option for regular folks, no idea how big the difference is going to be and if they will require proof of ownership of the digibook. The followup news is actually quite interesting as well. It seems there will be a digibook release of "I'm a Cyborg, but that's okay".